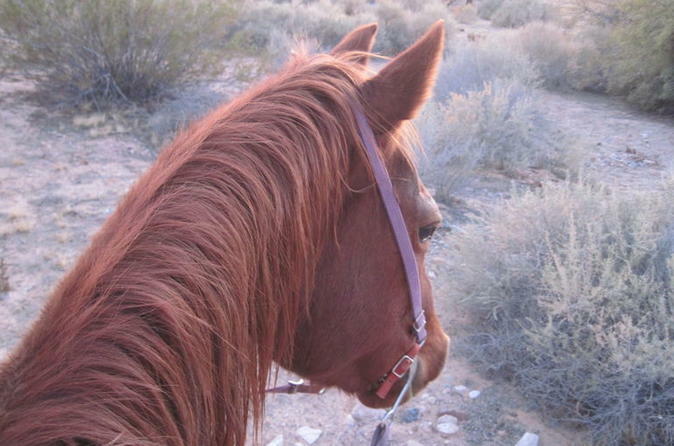 Your friendly and knowledgeable driver will pick you up from select Las Vegas Strip hotels for the 30-minute ride to the ranch located next to Red Rock Canyon. Upon arrival, your wranglers will match you with the perfect horse for your ride. All the horses are friendly and tame - perfect for all riding levels. Ride along the same trails used by some of the most infamous outlaws of the American West. The ride is approximately 1 hour. Look out for big horn sheep, road runners and jack rabbits which all frequent this area. After your ride, dine on a cowboy lunch of angus burgers or chicken, choice of baked beans, potato salad or french fries and finished off with dessert. After lunch, head over to the cowboy town and petting zoo, before being returned to your hotel with plenty of time left in the day to see more of the sights of Las Vegas. Special Offer - Book with us and save 12% compared to another travel site! - Book Now!